For many drivers across Idaho, it is important to make investments that provide the best protection and value. Purchasing new tires, for example, will help to keep you and your ride safe in inclement weather. Those looking for the best protection for their truck beds can invest in LINE-X sprays to provide unsurpassed protection and value. LINE-X of Boise proudly provides the best LINE-X services to Boise drivers, relying on our years of experience and top-notch equipment to ensure you are happy with the results. 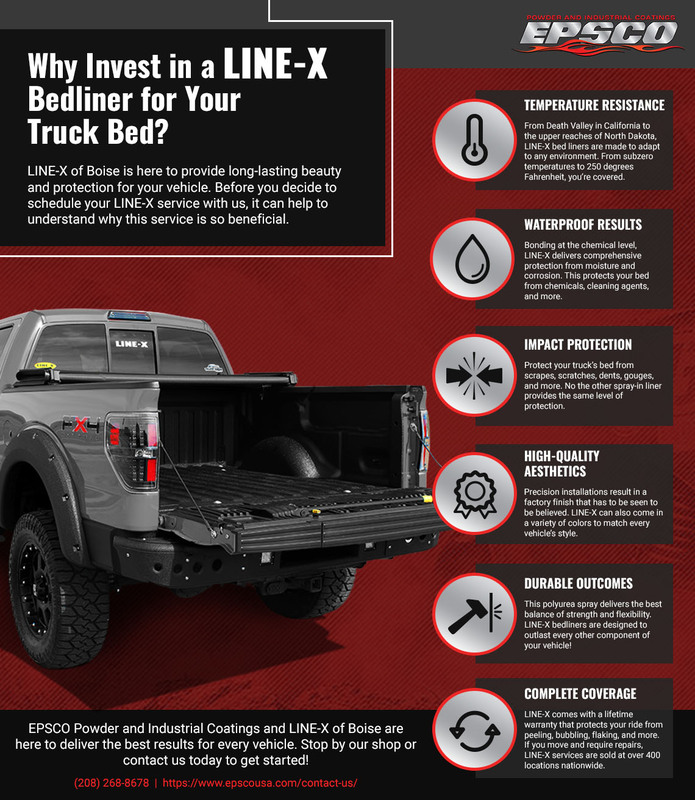 Today, we’ll discuss a few of the top reasons why you should consider investing in LINE-X spray-in bedliners for your vehicle. If you’re ready to schedule your appointment, feel free to contact us online anytime! One advantage that LINE-X has over other spray-in bedliners is that it is rated to withstand extreme temperatures, ranging from subzero to upward of 250 degrees Fahrenheit. If you decide to take your truck from Death Valley to Williston, North Dakota, you can rest easy knowing your truck’s liner is able to adapt and still deliver a full range of protection. LINE-X liners bond to the surface of your truck’s bed at the chemical level, delivering uncompromised protection from moisture and subsequent corrosion. This can prove beneficial in protecting your vehicle from a variety of caustic materials, including cleaners, fuel components, chemicals, and more. EPSCO Powder and Industrial Coatings specializes in powder coating, and our LINE-X shop will work with precision to ensure that your new bed liner is installed to perfection. Our intensive preparation process primes the surface of your truck’s bed for the best bond possible. The top reason why drivers choose our LINE-X service in Boise is because it offers unsurpassed protection from the daily wear and tear placed on most truck beds. Scrapes, scratches, dents, gouges, and other problems can all take their toll on the beauty and integrity of your bed’s surface. LINE-X sprays are formulated to resist all manners of damage, resulting in a strong finish that can withstand the abuse of daily work tasks. Drivers of all types can benefit from this spray-in bedliner, as its technology is widely used by military and police forces around the world. Regardless of what you’re hauling, drive confidently with LINE-X of Boise! Our LINE-X sprays are installed using a high-pressure, high-temperature application system to create a perfect fit that looks like it came right off of the factory floor. Drivers across Idaho enjoy the protective benefits of LINE-X, and many are surprised by how rugged their vehicle looks after visiting LINE-X of Boise and EPSCO Powder and Industrial Coatings. LINE-X is available in a variety of colors and is highly UV-resistant, avoiding the fading effects of the sun for years to come. Contact us today to learn more about the advantages of this vehicle protection service! This polyurea spray is formulated to deliver the best balance between rigid strength and versatile flexibility. As a truck bed coating, LINE-X is suited to outlive the rest of your vehicle, increasing its resale value while delivering long-lasting protection. Drop-in bedliners are cheaper up front, but the long-term costs of repairing and replacing these temporary solutions can quickly outpace the price tag of LINE-X. LINE-X bedliners are made to be the best, which is why they come with a Limited Lifetime National Warranty. This means that your LINE-X spray is warrantied for the life of the vehicle (or as long as you own it), offering complete resolutions for flaking, bubbling, peeling, blistering, or any other problems related to the installation process. If repairs are needed, our team can work to quickly and effectively remedy the damaged area for a fresh new appearance. If you move across the country, don’t worry about your coverage! LINE-X is available at more than 400 authorized retailers across the country, ensuring that you have qualified support should anything go wrong with your spray-in bedliner. LINE-X of Boise is here to serve as your professional spray-in bedliner pros, providing a full range of services to outfit your truck for years of success. There are many more benefits associated with LINE-X sprays, so be sure to call us today to learn more. You can also stop by our powder coating shop on West 37th Street for the best truck accessories and protective services. We look forward to helping you!